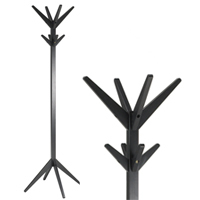 Another favourite from our designer friends in Japan, our new tree coat stand has 4 independent rotating branches, providing plenty of storage space for all of the families coats and hats. 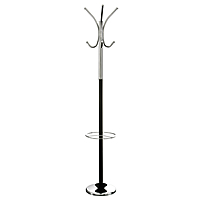 White metal and natural wood clothes rail / coat stand offering a full length hanging rail and shelf. 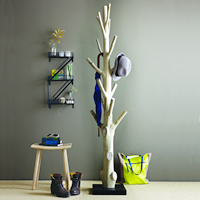 Great for a hallway or additional storage when wardrobes are bulging, or perhaps for use in the spare room when company calls. Neon light inspired wirework wall mounted 'hello' coat rack. 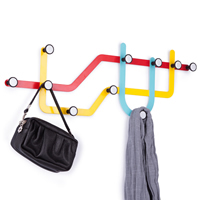 London Underground inspired coat rack with 10 storage hooks. 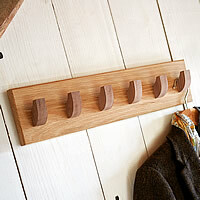 Handmade solid oak coat hook from the workshop of our Welsh designer friend Gafyn. 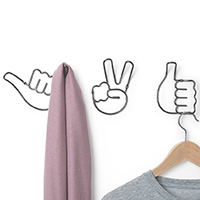 Top quality brushed stainless-steel coat hook for those who want the minimalist look. 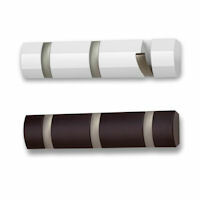 This item looks stunning in the flesh and is finished to the highest standard. 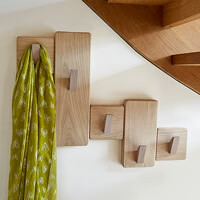 Handmade in North Wales our solid oak ascending coat rack has been designed to sit perfectly under a staircase. 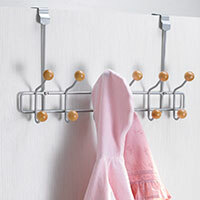 Pop little one's coats or scarves and bags on the lower hooks and grown-ups coats on the upper hooks of this top quality coat rack. 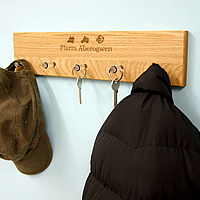 Use over the door OR mount directly to the wall for coats, jackets and bags. Available in walnut or lightwood. 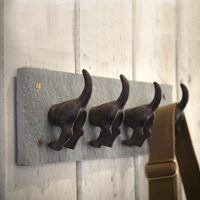 A smaller version of our best selling coat hook designed by David Quan. 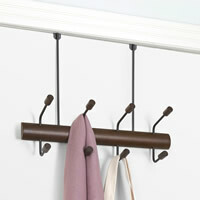 This time it's back with 3 hooks and is perfect for small hallways. Wall mounted powder coated coat rack and shelf cleverly created by our designer friends in the Oxo Tower Available in black and white. 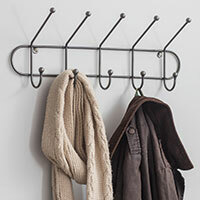 5 double hook Farringdon coat rack with an industrial finish. 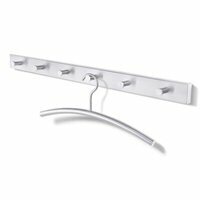 White stainless steel 10 hook rail with light wood veneer detail at at great low STORE price! Stunning coat and brolly stand in a sturdy brushed stainless steel... ... Would you expect anything less from our friends in Germany? 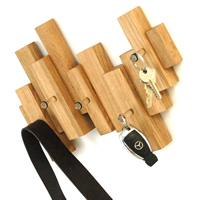 Yosemite coat rack hand crafted from the Mangosteen tree. Each rack is hand finished and retains the natural imperfections of the tree for a unique finish. 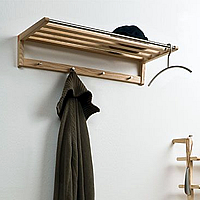 Practical and stylish raw oak hanging rail with 6 storage pegs. 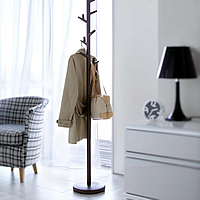 Stylish, sturdy and functional, our new wooden Studio Coat Stand looks stunning in any hallway and is available in either black or white. 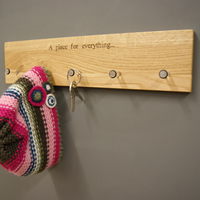 Made exclusively for STORE in the workshops of our designer friends Gafyn and Sean in Wales, our 'A Place For Everything' coat hook is handmade from solid oak. 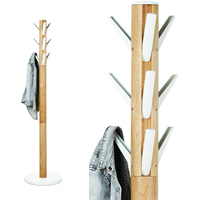 White metal and natural wood clothes storage rack offering both full length and double half height hanging. 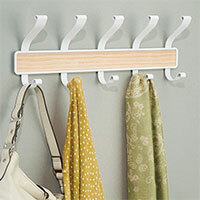 Great for additional storage when wardrobes are bulging or for using in the spare room when company calls. 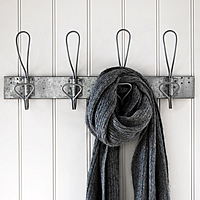 White metal over the door OR wall mountable organiser with 14 wooden hooks. 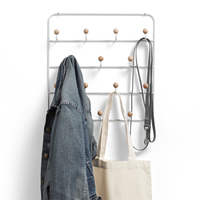 Contemporary coat rack with hanging rail, shelf and four stainless steel hooks. 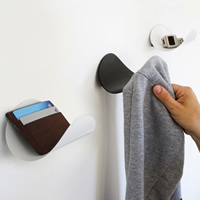 A great addition to neaten up any hallway. 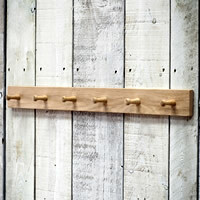 Handmade solid oak coat and key rack which we'll personalise with your family or house name at no extra charge. 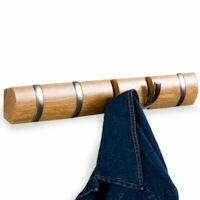 Artistic take on the humble coat rack from the designers from J-ME. 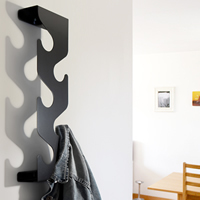 Our wall mounted metal Wave is available in a powder coated black, platinum or a white finish.